Every now and again I post a short book review on AnswersInGenes, and every now and again I don't. For example, I know at least one reader who is itching to hear my review of "Should Christians Embrace Evolution? ", even though he knows I'm going to trash it and make mean comparisons to "Should Christians Embrace Gravity?" or "Should Christians Embrace Telephones?" Facts are facts, whether they cause you the theowobbles or not. Big boys don't cry about such things. But I merely throw this out by way of a teaser. I *will* review that book. Some day. But not today. 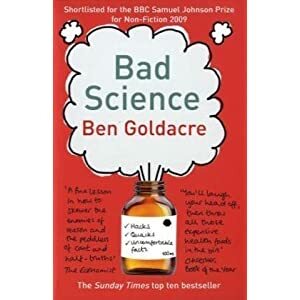 Today I would like to draw the attention of whatever readers manage to dodge the tumbleweed and jangle their spurs down the dusty main street of this ornery ghost town to the supremely brilliant book "Bad Science" by the fantastic Dr Ben Goldacre. In a joyous, but nonetheless rigorous and meticulously researched, romp through the world of alternative medicine and similar pseudoscientific nonsense, Ben comprehensively debunks the likes of "Dr" Gillian McKeith, the former darling of the stool-gazing media, whose qualifications and claims do not stand up to the remotest scrutiny. That should be enough in and of itself, but no. There's more. Demolishing the bogus claims of outright quackery like homeopathy and Andrew Wakefield's atrocious MMR vaccine hoax, Ben cuts like a knife through rancid butter. But it is not just a debunking mission - along the way you learn about things like the placebo effect (profoundly misunderstood by the public), regression to the mean, and other sources of bias that scientists are very much aware of, but charlatans love to use to con the public. This is one of those books where you come out the other end *smarter* than when you started - and that is always a good thing. I can't recommend it highly enough. I'm reading that at the moment! It's a brilliant book. I thought that the chapter on the Placebo effect was informative, and I think that I can now add "insightful". This chapter also establishes that Goldacre is open minded, and is not dismissing alternative therapy beacuse it doesn't fit into his world view. He's prepared to say that there are limits to his understanding. But that he also knows when someone hasn't made a medical breakthrough. And the chapter on McKeith!!! I hadn't realised just how bad she was!!! I await her lawsuit eagerly! I don't think Ben has to worry about a lawsuit from Ms McKeith - even before the libel laws were challenged, it was evident that she was *busted*. The point about open-mindedness is a good one - often we sceptics are portrayed as being closed minded to "new" ideas that "don't fit our worldview". Indeed, William Crawley put just this point to me at the recent panel discussion after "Inherit the Wind": is my opposition to "Intelligent Design" in the Ulster Museum a worldview thing? I said that if ID could make some testable hypotheses and back them up with evidence, then bring it on by all means. Until then, it is just fluff and assertion. Same with homeopathy and a lot of other woo - the null hypothesis says there is bugger all there, and so far ALL the evidence favours the null hypothesis. That *is* being open-minded. It's an escape from what Sagan called "The Demon-Haunted World".